Authors: Kay-Yut Chen, Marina Krakovsky; Format: Hardcover; ISBN: 9781591843542; Release Date: 2010; List Price: $25.95; Publisher: Portfolio Penguin; Length: 246 pages; Edition: 1. Condition: Good. Some pages have pencil underlining. Otherwise pages look good, binding is strong, and dust jacket and cover are both still in overall great shape. Same cover design as that shown here. This text translates the findings of behavioral economics into concrete actions to achieve new levels of success, taking behavioral economics from the cocktail party to the boardroom with dramatic results. Books like Predictably Irrational and Nudge have brought behavioral economics into the mainstream. But while we all marvel at how different--and weird--real people behave compared to the "rational actors" of traditional economics, in the end we go back to business as usual. After all, what do a few laboratory experiments have to do with making a buck? As economist Kay-Yut Chen has shown, quite a bit. Chen started behavioral economics research at Hewlett-Packard, founding the first such "moneylab" at any company, let alone one in the Fortune 500. His groundbreaking research into human behavior has led to tangible results for HP. In fact, he has saved the company millions of dollars by showing how changing the right conditions can make people behave very differently. 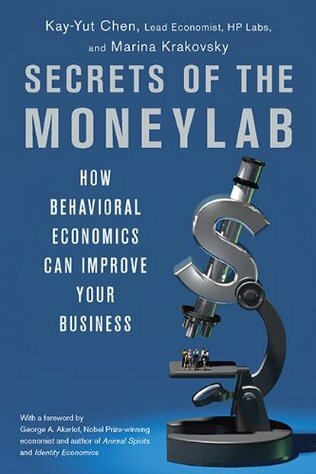 Secrets of the Moneylab offers practical lessons being put to use right now at HP and other leading companies. Priority Mail delivery for this item costs $8.00 at the request of a buyer. Otherwise, the shipping rate given here applies to orders shipped via Media Mail within the U.S. only. Orders consisting of multiple purchases packaged together ship by any of these delivery methods at a discounted rate, usually for only $1.00 per additional item plus the shipping fee for the first item (determined to be the one with the highest delivery charge). International buyers: please contact us with your destination country for applicable base shipping rates. Multiple purchases that are packaged together save shipping costs for you, too!